The evaporator , boils sea water at the saturation temperature corresponding to the uniform pressure through the evaporation and condensing chambers. With flash evaporators (Figure below) the water is heated in one compartment before being released into a second chamber in which the pressure is substantially lower. The drop in pressure changes the saturation temperature below the actual temperature, so that some of the water instantly flashes off as vapour. Steam in the chamber at sub-atmospheric pressure is condensed by contact with tubes circulated with the salt feed and is removed by a distillate pump. Suitably placed baffles and demisters, similar to those already described, prevent carry-over of saline droplets. The arrangements for continuous monitoring of distillate purity are similar to those described above. If two or more vessels in series are maintained at progressively lower absolute pressures, the process can be repeated. Incoming salt feed absorbs the latent heat of the steam in each stage, with a resultant gain in economy of heat and fuel. This is known as cascade evaporation, a term which is self-explanatory. 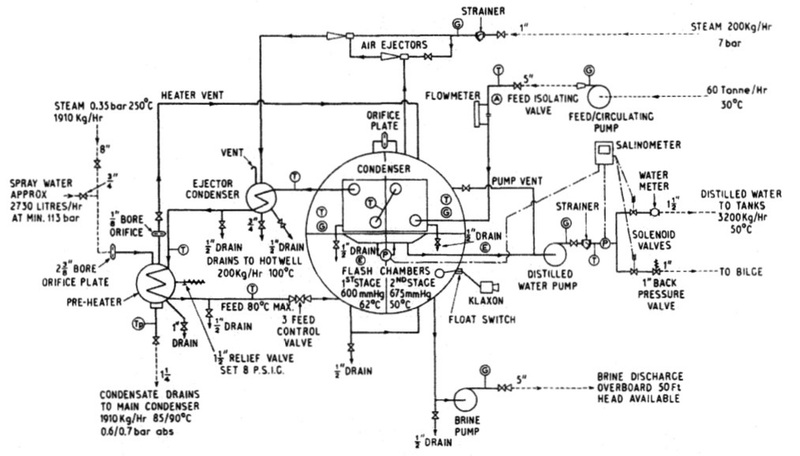 Figure below shows a two stage flash evaporator distiller. 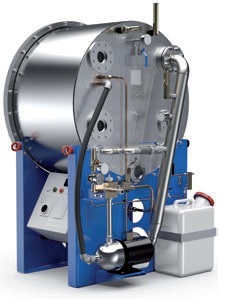 The flash chambers are maintained at a very low absolute pressure by ejectors, steam or water operated; the salt feed is heated initially by the condensing vapour in the flash chambers, subsequently in its passage through the ejector condenser (when steam-operated ejectors are used) and is raised to its final temperature in a heater supplied with low pressure exhaust steam. Brine density is maintained, as in the case of the evaporator-distillers described previously, by an excess of feed over evaporation and the removal of the excess by a pump. The re-circulation of brine may be provided for in plant. It should be noted that when distillate is used for drinking it may require subsequent treatment to make it potable. The unit used for conversion of seawater into fresh water by vacuum distillation based on evaporation and condensation. Single-stage freshwater generator consists of a chamber with two titanium plate packs acting as an evaporator and a condenser respectively. A vacuum of 85-95% is maintained in the system by a brine/air ejector. - The seawater pump is enabled through a control panel. - After passing the condenser section the seawater will flow through the air-brine ejector. - A small part of the seawater flow is used as feed water to the evaporation section, where it is then divided into each second channels. - Through a suction process the air-brine ejector removes the air from inside the casing and the excesive feed water. - After maximum of 5 minutes a vacuum of approx 90% is reached. - Open the valves on the hot water inlet and outlet piping line. - The evaporation of the feed water will start immediately. - The vapour will flow through the demister and will be condensed in the condenser section. - Please start the freshwater pump after a maximum of 2 minutes after opening for the hot water line. 40°C due to the vacuum condition as it passes between the plates of evaporator heated by hot fresh water from the engine jacket cooling system, or by steam. Generators can be equipped with disinfection units (Chlorination, UV-radiation and Silver ionization), pH-adjustment and rehardening filters. Copyright © 2010-2016 General Cargo Ship.com All rights reserved.